Culture is a funny thing. Certain actions or behaviors become socially “normal” to us and we no longer really think about them, we just do them because that’s just how things are. The perfect place to see varying cultural norms (particularly ones regarding to space, time, and lines) is in the airport. Yesterday when I was getting ready to board my flight from Jakarta to Dubai, I was surrounded by mass chaos. Everyone piled into the waiting area and sat as close to each other as possible. Once boarding began, 90 minutes late, everyone disregarded the person calling the boarding regions and rushed the gate en mass–forming a giant glob of people all trying to enter the plane at the same time. Fast forward 15 hours when I was sitting at my gate with Europeans in Dubai getting ready to board my flight for Madrid. Everyone was sitting down and spread throughout the whole waiting area. When the Emirates people called passengers to board based on their boarding regions, people stayed sitting until their region was called. Once their region was called, they formed an orderly line to enter the plane, ahead of schedule. Without consciously thinking about the situation, I was taken aback by how bizarre the orderliness of boarding the boarding in Dubai was. I felt out of place without the mass craziness around me. It seemed strange that people would stick to lines and board ahead of schedule. Crazy to think that four months ago I would have felt more at home in the orderliness, but now it just feels odd. The funniest part about the whole experience was that I hadn’t even realized how much I had adapted to the Indonesian norms of space, time, and lines until I felt out of place in what I had previously considered “normal.” At the time, I didn’t fully realize that the Jakarta airport experience was chaotic, because that’s just how things are in Indonesia. I guess it’s a good sign that I am adapting to the way life works there, because that’s home for the next two years. Who knows, maybe in six months I won’t even like straight lines anymore. 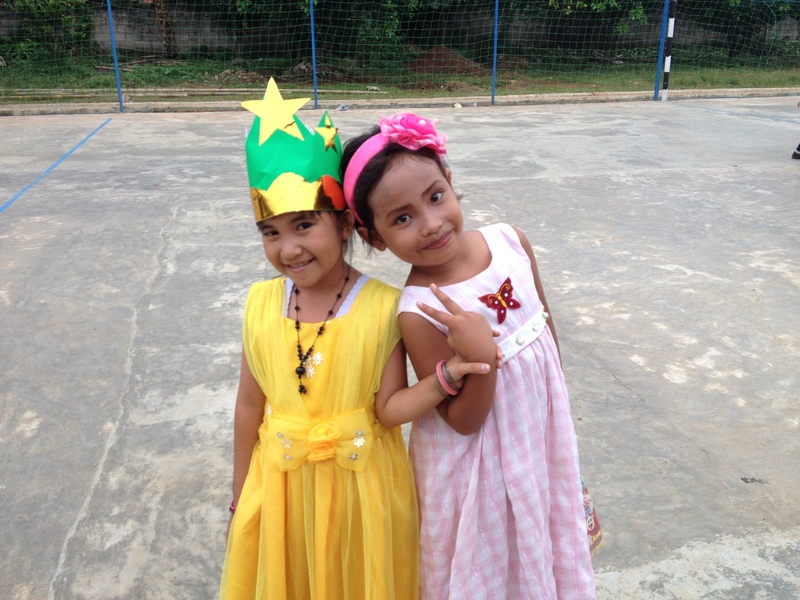 Friday I had the opportunity to go to a Christmas production by a school we (Partners for Compassion) sponsor about two hours outside of Jakarta. To get to the school you feel like you drive to the ends of the earth and then turn right. Driving on dirt roads or paved roads with giant potholes really felt like an authentic back-roads experience. When we finally got there, we were a few minutes late, but luckily the production had not started yet because there was a slight make-up crisis. Because I am a buleh (Westerner) apparently I must know something about makeup, so I got recruited to help finish getting the girls ready. It was a flash back to my years in Christmas presentations–helping tie halos and putting make up on some of the younger girls. Apparently in Indonesian Christian culture you cannot just have a Christmas presentation, you have to have a whole church service first. So before the Christmas presentation started, we did a one hour services consisting of worship, a message, offering, and a candle lighting ceremony. After the church service, then the school presentation began. It was so interesting to hear the opening welcoming remarks after having sat with the same people for the last hour, but since that’s how they did it, I just rolled with it. 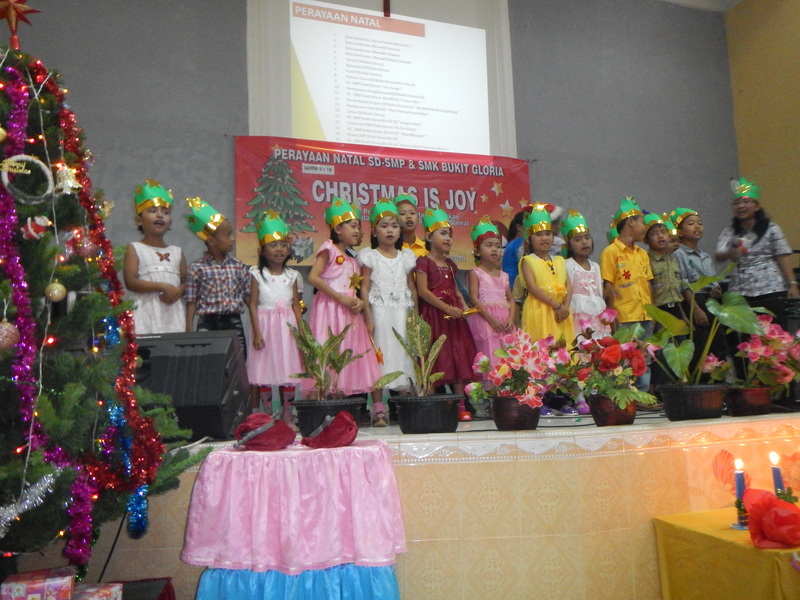 The kindergarteners and elementary school students were the first to perform. I think they were just as excited to be able to finally stand up as they were to perform! They were so cute in their little crowns. The rest of the production consisted of songs, dance, poetry, more songs, and a drama from each of the grade levels. At the conclusion of the Christmas pageant, we were invited to stay and eat dinner with all of the teachers. After eating, Korry and I decided to take a walk around the school with one of the new teachers. Two of the first grade girls came up to us and decided that we should be friends. They were super shy, so we didn’t actually have a conversation past what their names were, but they were so cute and so sweet, that it didn’t even matter. The whole experience reminded me a lot of Mexico. The outfits, the music, the atmosphere, it felt very familiar–like I was walking back to my childhood. That seems to happen a lot here in Indonesia. Who knew that growing up in Mexico would make me feel at home for the holidays in Asia? So I know that this goes against all the math principles I learned in school, but numbers are not sequential…at least not in regards to building numbers in Jakarta. When trying to find a house in any other part of the world I’ve visited, you find the street name and the house numbers go in order–either up or down depending on which direction you walk or drive. Well, in Indonesia it doesn’t quite work that way. Wednesday I was on my way to the sub district health office for a meeting with the director of maternal and child health for the north Jakarta sub district and was trying to find her building. In general it is difficult to find a new location, but streets signs are more of an option rather than a necessity here. But even once you find the correct street, it’s hard to find the actual building you are looking for. So on Wednesday, we got on what we thought was the right street but we couldn’t find #29. We passed #2, #98, #17 (in that order), but could not find 29. I was so confused as to why the numbers were in no particular sequence–there weren’t even odd numbers on one side and even numbers on the other–it just seemed completely random. However, I learned from my boss that there actually is a reason for the un-sequential house numbers. Apparently when roads change names, the numbering of the houses starts over for the new houses, but if you are a current resident of a house on the street you have the option of keeping your previous house number–even though the name of your street changes. That is why you end up with houses next to each other numbered 4, 25, 7, 240, 10. I find it quite confusing, but it certainly makes for an adventure any time you try to find a building you’ve never been to before!